You know that fizzy feeling of happiness and completion when you finish a really good book, one that you know you’ll read again and again? That. I have it. I’ve just read a smart, scathing comedy-of-manners, complete with status-obsessed mothers, impoverished young relatives, flighty males bent on spending their way through the family fortune… and DRAGONS. Yes, this book and I were made for each other. Jo Walton’s Tooth and Claw is freaking brilliant. A tale of love, money, and family conflict—among dragons. A family deals with the death of their father. A son goes to court for his inheritance. Another son agonizes over his father's deathbed confession. One daughter becomes involved in the abolition movement, while another sacrifices herself for her husband. And everyone in the tale is a dragon, red in tooth and claw. Here is a world of politics and train stations, of churchmen and family retainers, of courtship and country houses… in which, on the death of an elder, family members gather to eat the body of the deceased. In which the great and the good avail themselves of the privilege of killing and eating the weaker children, which they do with ceremony and relish, growing stronger thereby. You have never read a novel like Tooth and Claw. Family patriarch Bon Agornin is dying, and his surviving children are gathered at his deathbed. There is the cleric Penn, the married and self-satisfied elder sister Berend, the younger brother Avan, making his way in the world, and two younger sisters (Selendra and Haner) still living at home. Their father’s death and bequests will change their comfortable world completely, and each of these dragons will find the future a rather dangerous unknown. 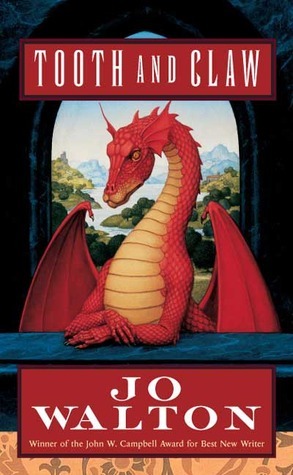 Others have described this book as Jane Austen, but with dragons. I agree to a point. Walton meticulously describes the familial scene and conflicts, within a larger, hierarchical society influenced by politics, connections, and acting in accordance with propriety and tradition. However, Walton is not winking at the reader with caricatures from her own time as Austen did. She’s taken the tropes of the Victorian novel and changed the essential biology and beings in play, making for a complex, wryly funny mash-up of genre. It’s all beautifully written, too – I couldn’t put the book down. Oh, and it’s just fun! Of course, it’s not all ideas and power struggles – there’s a great story, too, with bits and pieces from different locations interweaving into a whole. The action follows the siblings as they leave their father’s home, but there’s more focus on Selendra’s story arc than the others’, and her course is full of treasure, romance, close escapes and spirit. I fell in love with most of the characters, but Selendra was my favorite (as she’s meant to be). I don’t think I’m spoiling anything when I say that the reader is left satisfied at the end, as anyone reading a proper Austen novel would be, though there are moments when you can’t see how it’ll turn out right. In all, Tooth and Claw is a clever, entertaining, and elegant little fantasy novel, and it fit this reader perfectly. It’ll definitely be on my ‘best of 2013’ list at the end of the year. Many thanks to The Book Smugglers for the recommendation! Recommended for: fans of fantasy, those who like unusual and interesting plays on genre, and anyone who feels a spark of interest at the thought of a Seraphina/Pride and Prejudice mash-up. I'm definitely interesting in a Seraphina/Pride and Prejudice mash-up. Oh my! This sounds really really good! I'll have to see if my library has it. Oh wow! I have not heard of this book. I've read a Jo Walton book and loved it. I love Dragon stories. This book appeals to me; greatly!!!! Excited to put this onto my reading list. Thanks for putting it on my radar. You had me at talking dragons. I'm going to have to take a look next time I'm at the store. I own this one and haven't read it yet! Must read it soon. Jo Walton was definitely one of my favourite authors this year. Tooth and Claw is amazing. I agree with you that we are left satisfied at the end BUT I would have liked more books set in this world, even though a sequel would have been extraneous.